Sea Eagle Boat Race Race akin toned up by 12 rowers from local and foreign teams which competed akin fast on the track that has been established by the committee. They will challenge the strength of water currents Rear Padang in 2 to 4 July 2010. Event International Boat Race Sea Eagle is designed with a new concept. Because, in addition to the game, akin also held several events and cultural attractions and exhibitions small and medium business (SMEs) to further add a lively atmosphere. Sea Eagle Boat International Race was also invited as Singpura negra neighbors, Malaysia and Brunei. The game is divided into two categories, International and local. This event is going to fight over the trophy Batam mayor, money coaching, and certificates with a total prize of Rp 46 million. 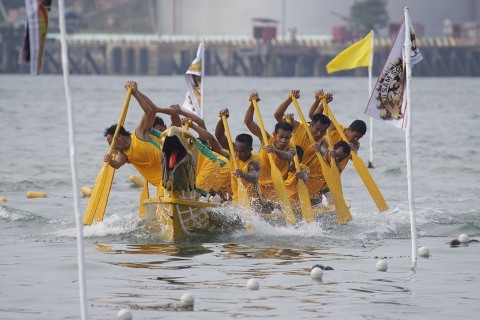 Chief executive of this international event, Buralimar, said that there are fundamental differences between the Sea Eagle boat with the Dragon Boat. According to him, the Sea Eagle difficulty level when the spin will be more felt by the rowers. "Although there is no fixed rule about this sport, but we are more focused to the entertainment and tourist visits. Sea Eagle Boat will be held at night, so it displays shades of the Padang Rear beauty. At the opening, bringing akin Pemko Batam Chen Ho's ship the Golden Beach resort to enliven the mat. "We really wanted to sell the tourism potential in the Rear of Padang. The opening will be planned to be attended by ministers of Culture and Tourism and Minister of Youth and Sports, "explained Buralimar.